from the Artist, Elizabeth Cameron. All work is copyrighted. 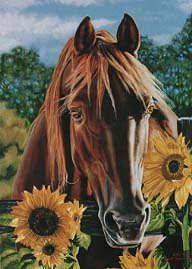 This portrait was done as a surprise for Joe's wife Lisa. a new vet or someting! 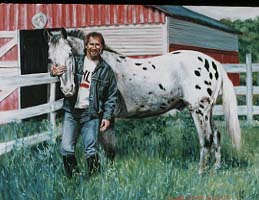 Gary Evans & Domino - The Birthday Present"
I had taken the day he got Domino. They were instantly old friends. Morgan stallion while visiting the ranch a few years ago. Eethree was as curious about me as I was about him! I added the sunflowers to represent New Mexico. 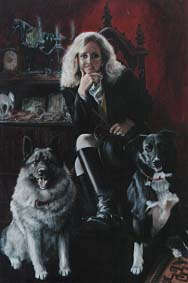 Self Portrait with Wolf & Skippy. from. 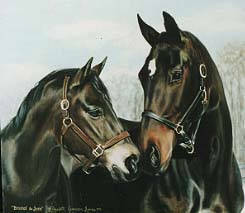 We posed her gelding at left to complement the mare's pose. for them as they often watched for Marsha. 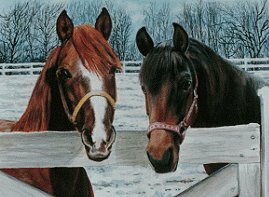 blown away by how perfectly she captured the horses' personalities. I knew I wanted to have Libby immortalize her for me. summer reading program storytelling performances for 14 of their libraries. watercolor so amazing Trib seems about to step out of the painting. I see it every night. Every visitor remarks on it."